Features enormous, dense upright panicles of flower heads that start out a soft lime green, fading over the summer to white and finally brown in fall. Limelight Hydrangea (tree form) will grow to be about 6 feet tall at maturity, with a spread of 7 feet. It tends to be a little leggy, with a typical clearance of 3 feet from the ground, and is suitable for planting under power lines. It grows at a medium rate, and under ideal conditions can be expected to live for 40 years or more.This tree performs well in both full sun and full shade. It prefers to grow in average to moist conditions, and shouldn't be allowed to dry out. It is not particular as to soil type or pH. It is highly tolerant of urban pollution and will even thrive in inner city environments. Consider applying a thick mulch around the root zone in winter to protect it in exposed locations or colder microclimates. 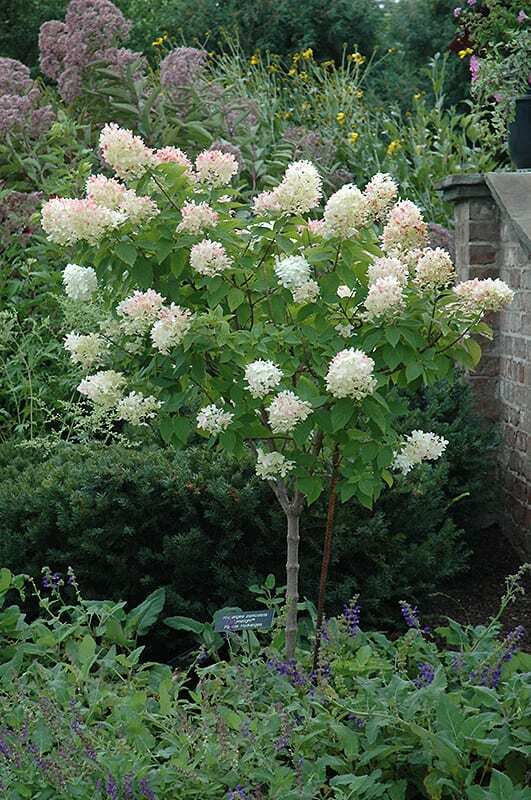 This is a selected variety of a species not originally from North America.Limelight Hydrangea (tree form) is a fine choice for the yard, but it is also a good selection for planting in outdoor pots and containers. With its upright habit of growth, it is best suited for use as a 'thriller' in the 'spiller-thriller-filler' container combination; plant it near the center of the pot, surrounded by smaller plants and those that spill over the edges. Note that when grown in a container, it may not perform exactly as indicated on the tag - this is to be expected. Also note that when growing plants in outdoor containers and baskets, they may require more frequent waterings than they would in the yard or garden.